! DURANGO KIT NOW IN PRODUCTION ! 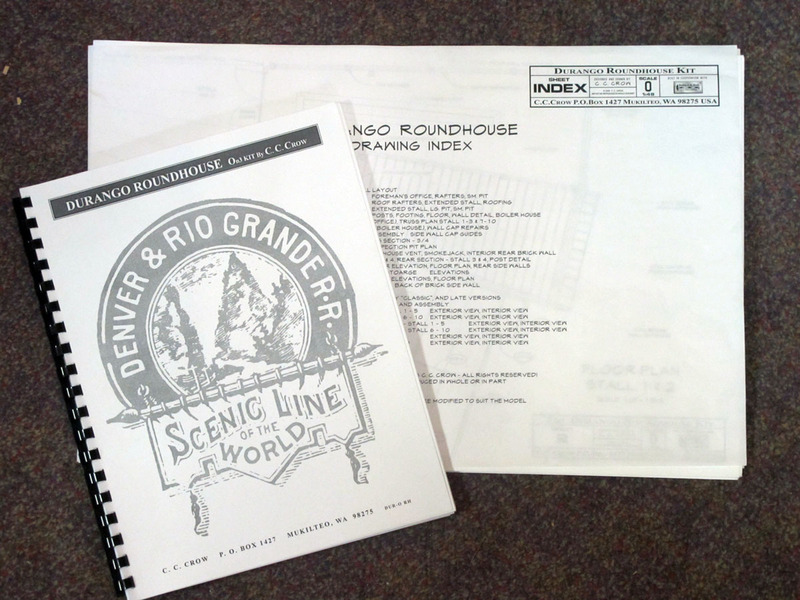 The Denver & Rio Grande - DURANGO Roundhouse! 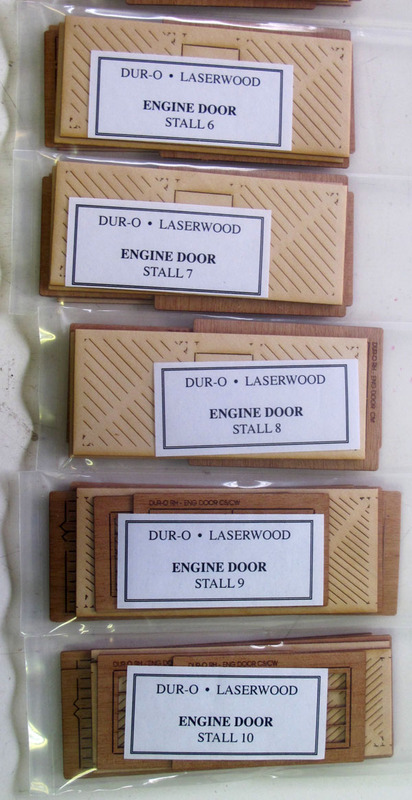 DURANGO FULL 10-STALL KITS BEGIN PRODUCTION APRIL 2011! Again, I apologize that this has taken so long. My guess is I'll be able to do about one per week but we'll see. Any new orders can expect to wait at least a year. Those who have reserved kits before February 1st, 2008 have a firm price of $125.00 per stall. Subsequent orders are currently $150.00 per stall but this could change once we go into production and I order additional materials. This is a limited run in the fact that the molds (and me, the caster) have a limited lifetime. Sooner or later we will give out. Don't look for a price break or second run. Grab them while you can! And please, no hoarding! We are doing both Durango (brick) and Gunnison (brick and stone). Not only are they narrow gauge icons, in quarter-inch, I think they are some of my best work yet. My friend Glenn Farley has built and installed Gunnison on his layout which be published in The Narrow Gauge Gazette and a highlight of the 2012 32nd National Narrow Gauge Convention (Sept. in Bellevue, Wash.) where you might also see my Durango pilot model. I have been posting photos of my progess on the patterns, molds, castings, lost wax and white metail parts, and the initial construction of my Durango pilot model. I know I need to post more but these will get you going. The footprint of our 71 foot brick roundhouse (17-3/4") is set back 96'-0" (24") from the turntable center with 14'-6" on center (3-5/8") stalls at the engine doors and 25'-0" wide (6-1/4") rear walls. We've intentionally done the roundhouse longer than the 67 ft. prototypes (actually this is an inside measurement while ours is the total length outside) so your model locomotives with their over-sized drawbars can better fit in. 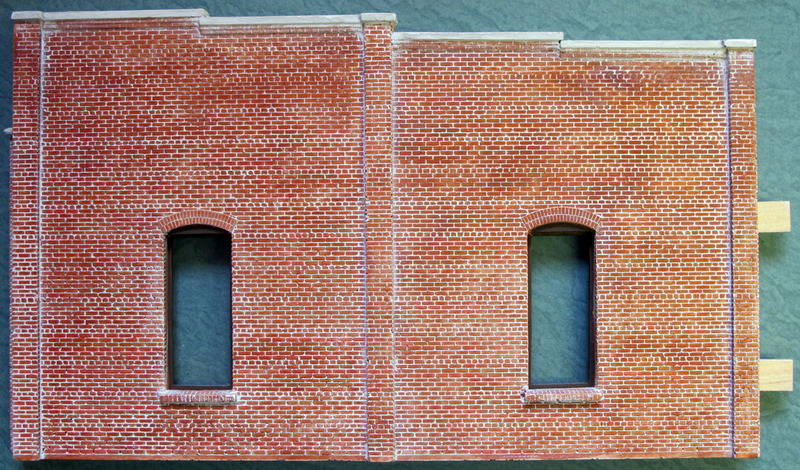 We also know space on your layout is often an issue so we have shortened the approach a little bit (little over an inch from the 101' prototype) thus widening the rear walls by about one scale foot (1/4") in the process. The resulting models if done with all 10 stalls (Durango) or 11 (Gunnnison) will just fit on a 4' x 4' sheet of plywood. See the "GENERAL LAYOUT" pdf footprints links below. We'll offer the following options for those who order the complete 10 or 11 stalls. Options may be limited on lesser orders. We'll see. 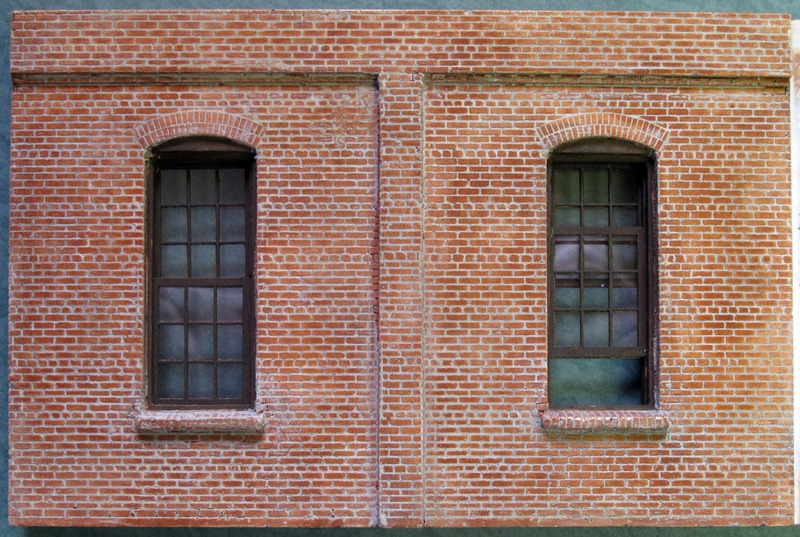 Originally, the engine doors were framed in brick. They were either engineered wrong, constructed improperly, or simply replaced with wider openings. 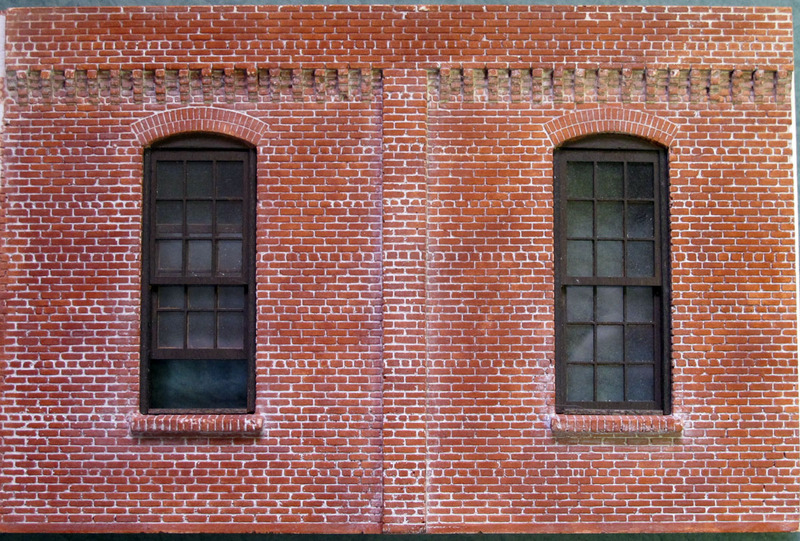 There is a photo showing a 10 stall roundhouse handsomely faced with brick poratls. The captions identifies it as Gunnison but this can't be- Gunnison had 11 stalls. So it must be an early photo of Durango. Later we see Durango was faced with wood frame construction while Gunnison was partially rebuilt in 1938 with six stalls done in wood. If there is interest we are offering this as "original" on both locations featuring handsome windowed engine doors and a clean brick face. Well, we have the castings anyway. We are offering Durango in two additional versions. The "classic" early version with windowed engine doors of various sizes, stalls 7, 8, 9 and 10 for instance heightened for the larger engines. And the "late" version, with non-windowed (rebuilt) engine doors, machine shop in stall 1, stalls 4, 5 and 6 extended. 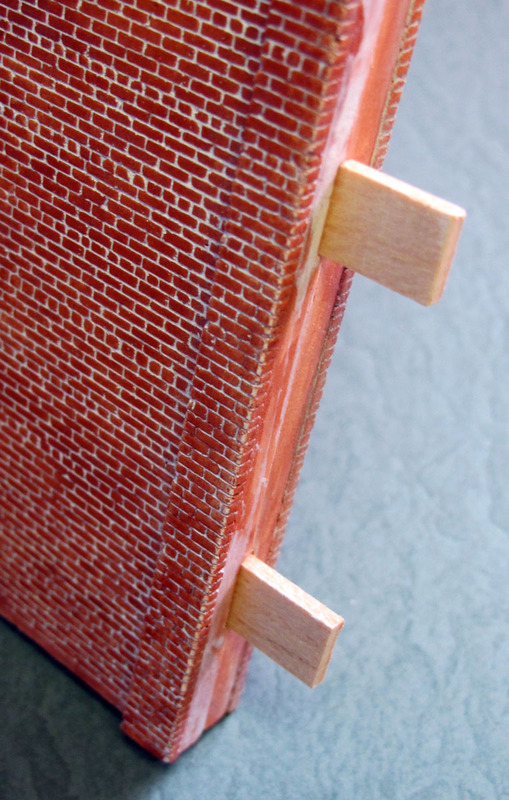 Instructions will be given on distressing and aging the brick as much or as little as you like. The cap stones for instance failed due to the harsh climate and were repaired with concrete patches. That's a simple fun project. 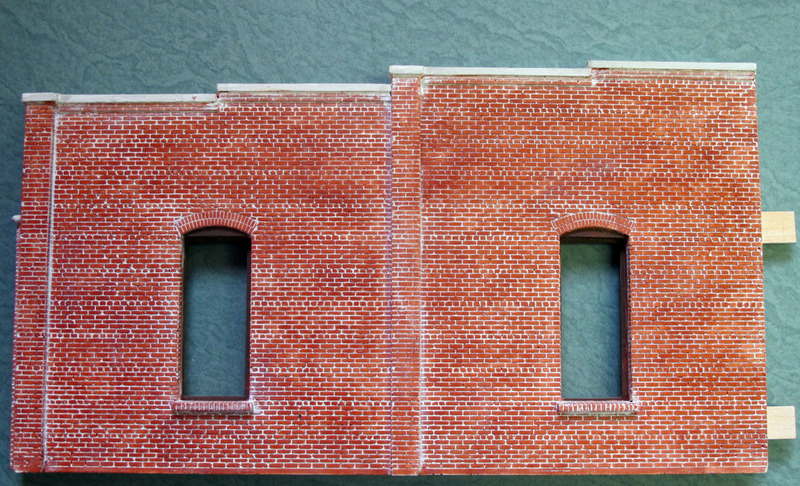 We are also doing the attached buildings for Durango. The boiler house and coal pocket to the north, and the foreman's office, crew room and storage to the south. We will treat these as additional stalls but you can probably talk me into including them with full ten stall orders. These are so interesting we decided to release them separately as two-stall dioramas. Then for Gunnison we're doing the classic mid-40s look with a mixture of door styles that is so hard to describe I won't even try. Just about each one is different! Stall 1 is fully windowed, stall 2-7 are extended and heightened, stall 11 houses the snowplow. Right side wall is stone. 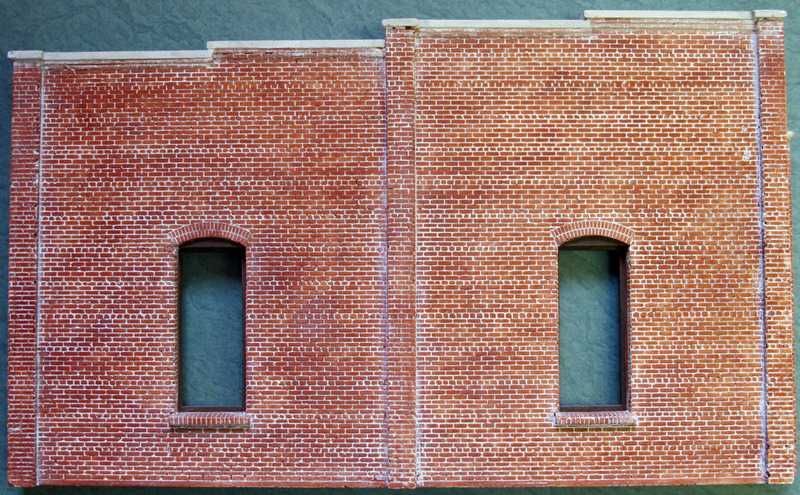 We will package the kits with a strict five stall minimum with the exception of either side of Durango, these as the side wall plus two stalls, and the boiler house or foreman's office, as a diorama. Additional stalls beyond the first five are $150.00 each. If you opt for the extended stalls you must purchase a minimum of three on top of the five masonry. These were wood frame construction modifying the existing masonry stalls adding 13'-0" (3-1/4") out the back on Durango, or 9'-6" (2-3/8") on Gunnison with 3 ft. in height there. 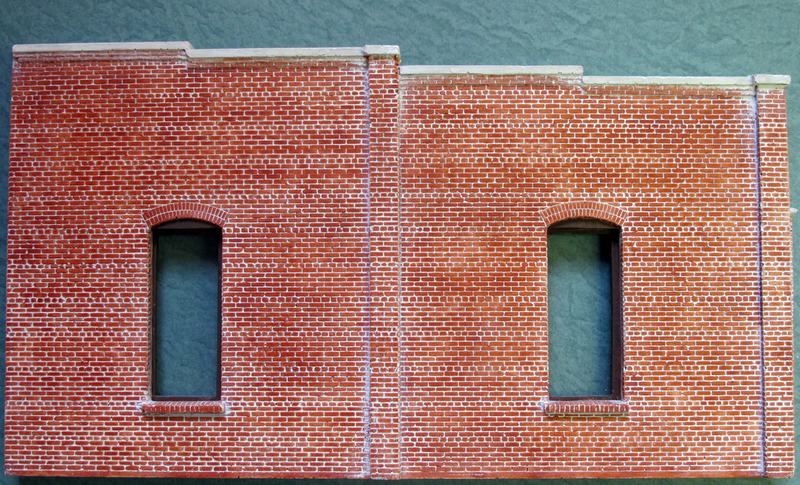 The models feature my hand-rendered scale brick expertly cast in White Hydrocal in my shop. It's not jobbed out to China or the lady down the street. We are using my hand-carved stone for the Gunnison version's right side wall, and same stonework for (1") foundations all around. The roof panels are precisely laser-cut and marked for rafter locations, with timber frame trusses, as are the wood frame extensions. 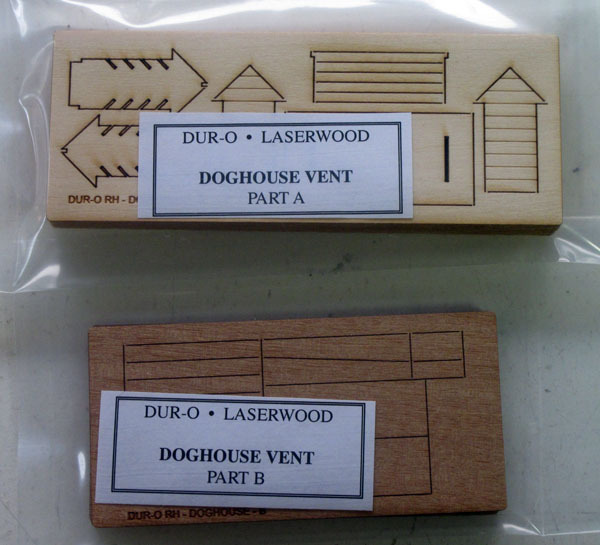 You will love the smokejacks, doghouse vents and other detail. 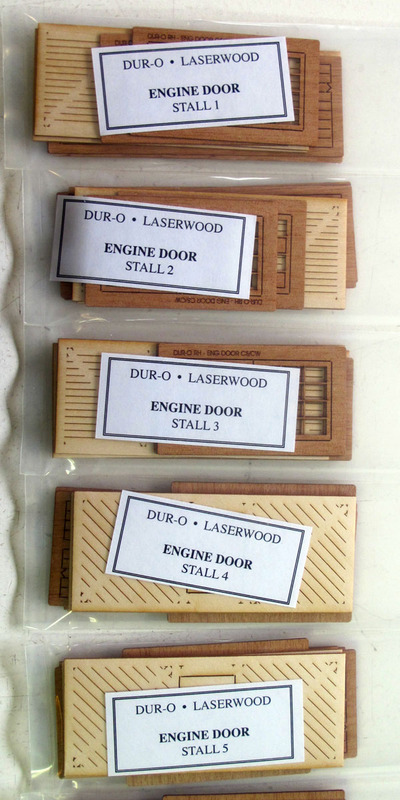 The engine doors are laser cut with working photo-etched hinges. 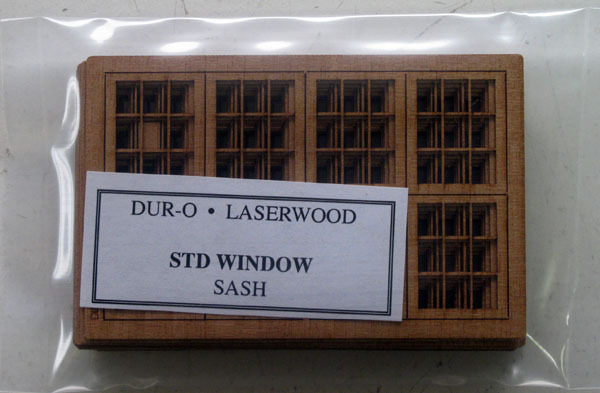 The windows are also laser-cut, with mullions on both sides of laser-cut "glass". They can be built wide open, or shut tight for winter. Cast Hydrocal inspection pits are included: two narrow and one wide per 5 stalls. Wow, pretty amazing when you put it all together! Well, we didn't stop there. Can you imagine the brick detail inside too! You don't have to imagine it, we did that too. This will be the ultimate display case for your prized On3 locomotive fleet and the focal point of your layout. In fact you can forget the rest of the layout and just model the engine facility. It will make a great place to display your roster. We spent years studying drawings and photos, figuring out just what was "right". There are many answers to that when you consider different dates, variations and two locations. Our intention is to provide you with the components to construct various versions of the roundhouses. Thus the brick patterns will be an early version that will allow you to modify to a later version, adding the concrete patches if you want, boarding up windows, fixing engine doors, extending stalls and so on. Right up to when Gunnison was torn down and Durango burnt (if you want to model it after the fire you can built the kit, burn it down (video on You-Tube please) and we'll discuss how you can rebuild it). To construct your model properly you'll really need to start from 1-3/4" below ground. Yeah, sorry, more than likely you'll have to scrap what you already have but trust me, in the long run it will be worth it. You'll want to build your new roundhouse and approach tracks on a good firm base (not supplied). We recommend a high quality 3/4" plywood (you'll need at least a whole half-sheet if you are doing all 10 or 11 stalls! ), with 1" of Homasote (double thickness) on top becoming the cinder floor. A 1" stone foundation will skirt this floor and can be buried (like Durango) or exposed (Gunnison), or whatever your layout requires. The inspection pits will be 1" deep as well and built into this base. Then on top the base we'll build our roundhouse model starting with the foundation. I recommend pinning the walls in place rather than gluing. Same with the timber trusses, and the roof panels simply lay in place. This allows you to refine the fits and adjust as necessary, access your locomotives, plus in the end you'll be able to disassemble your model and move it to new locations more easily- There are many benefits to a little extra work. My collaborator Glenn Farley has completed the Gunnison Roundhouse while I am lagging far behind on the Durango pilot model, now thinking I want to do the later version. If we wait for me to finish... We're much better off getting this thing into production! My model was shown at the 2006 Durango narrow gauge convention, Glenn's Gunnison at the 2008 Portland convention and no doubt will be a highlight of the 2012 convention to be held here in Seattle. Glenn plans to submit a feature article to the Narrow Gauge Gazette on Gunnison and I posting construction photos for Durango on the web site. See links below. Glenn scratch-built his 85 ft. turntable. I'm thinking about doing the same or maybe using a Wiseman kit (a copy of the old Colorado Scale Models kit). 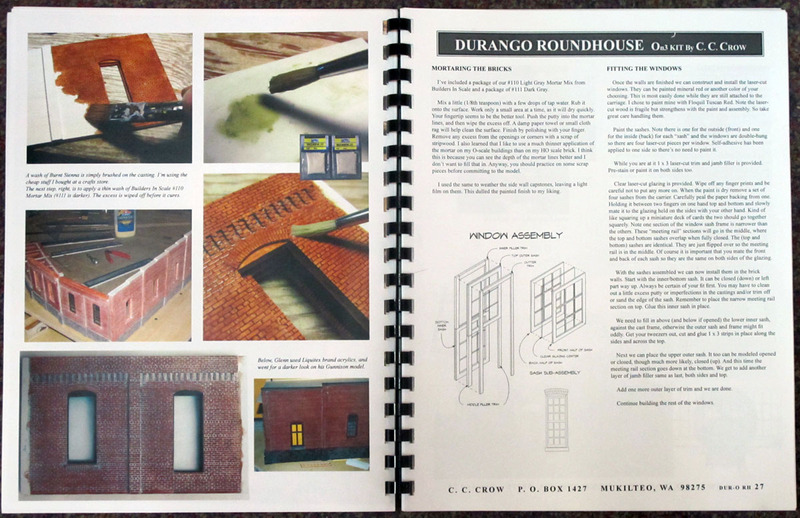 Complete 72 pages bound step-by-step instructions for the roundhouse are included. Tabloid-size plan sheets and templates include location plans (Gunnison and Durango), elevations for all sides, roof and truss templates, and assorted details. Everything you need to construct your museum quality roundhouse. 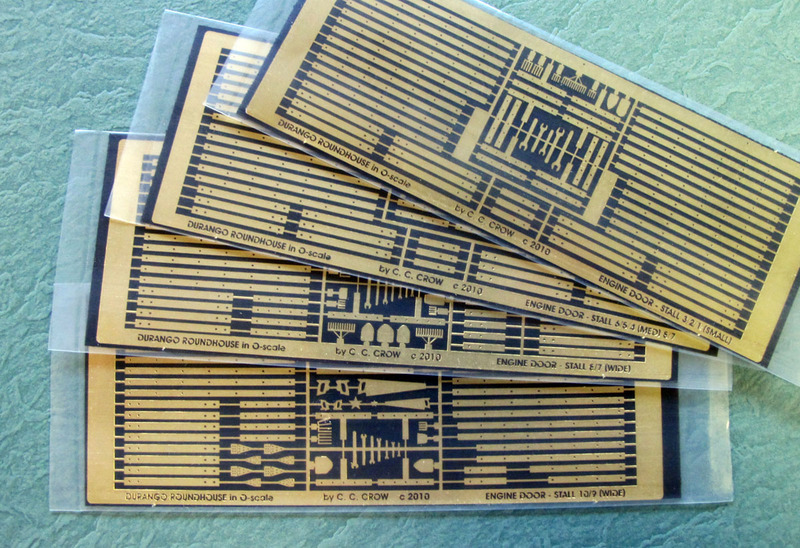 These are truly DELUXE C. C. CR"O"W SCALE models of the highest quality. Currently there are about 60 kits reserved. They will be released in the order of reserve starting with the complete Durango 10 stall kits first. Let me know your name, address, phone number and how many stalls of which location to reserve. For Durango let me know which era: original, classic or late. Write to reserve your model today. E-ORDER and I'll put you on the list. Only use these measurements for general planning at this time! The model will be a complete package including inspection pits and instructions on how to building it from the benchwork up. Due to slight shrinkage in the molds and other variables you'll want to adjust the footprint to match your actual castings. Open these files to determing which verion of Durango suits you. Note these are reduced 75% to legal-size. Here are a few photos of what goes in the box. 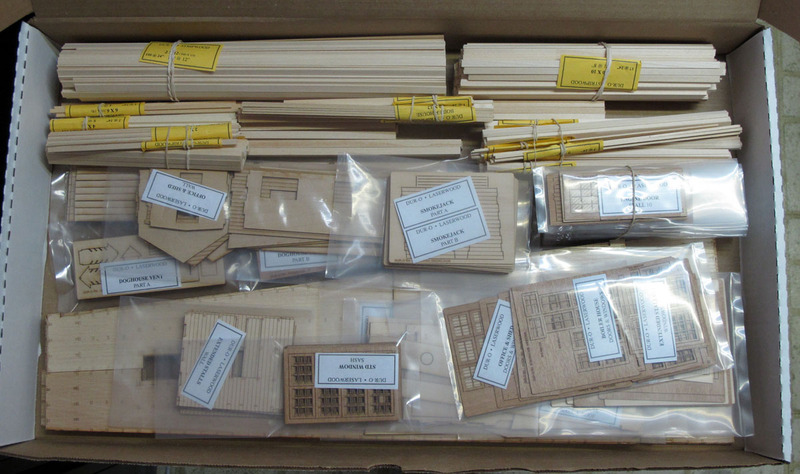 Here are the wood parts for the Durango kit. 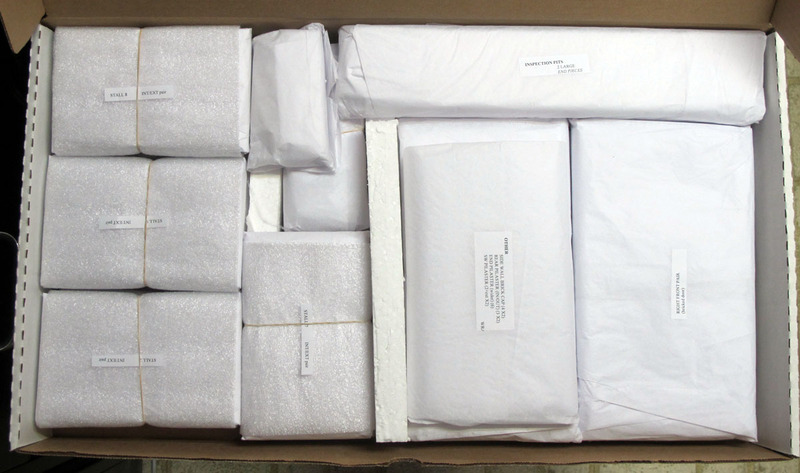 Here are the castings all packed up in the casting box. The 72-page bound instructions and tabloid-sized plans. Fully illustrated with color photos and detail drawings. The hinge straps are photo-etched. These come unfinished in kit. The sections are held with sticks. The pocket for the stick. Stall 10 exterior rear wall. Interior rear wall, stall 10. 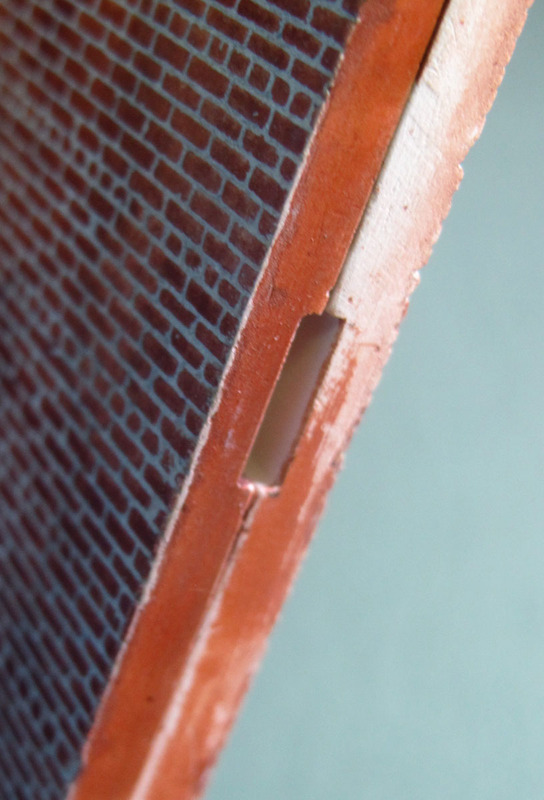 My favorite techniques for coloring and mortaring brick. Well, it's no secret. Full instructions are included in each kit and I explain it on-line, just click. How does he do that? Well, here's how. With a little practice you can too. If you like to scratch-build or just practice before you do, check out my stock castings. These are the same building blocks I use to create all of my kits.